HBO, the popular U.S. premium cable channel, yesterday announced the release of a new iPhone application [App Store, Free] offering schedule information, behind-the-scenes videos, and direct links to iTunes for purchasing content. 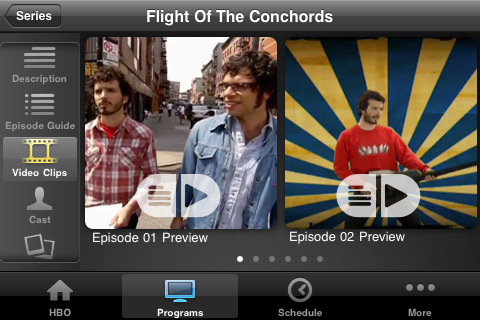 Using the innovative native functionality (scroll, pinch and zoom) of iPhone and iPod touch, the HBO App allows consumers to easily navigate through programming schedules, view short form video clips and episode guides, create reminder alerts for programs of interest as well as purchase full-length episodes and other content on iTunes and Amazon.com. The HBO application also allows users to automatically view program schedules based on their location, as well as offering Facebook and Twitter integration to allow users to share information from the app with others. A "hidden objects" game is also included within the application. "We think the HBO App for iPhone and iPod touch will quickly attract both HBO's loyal fans as well as new consumers," said Alison Moore, Vice President, Brand Strategy. "With the most up-to-date content and information about our programming, schedules, stars, and more, the HBO App will become a key entertainment resource for our consumers." Further information on the HBO application for the iPhone and iPod touch, including a "sneak peek" video, is available on HBO's dedicated page.